Andrew Tapia graduated from American University with a dual degree in International Studies and History. In 2018 he received his Juris Doctor from the University of Maryland School of Law. He was admitted to the California State Bar in 2018. Mr. Tapia is a member of the State Bar of California and the Mexican American Bar Association. 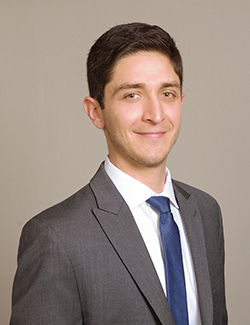 Mr. Tapia joined the Santa Monica office of Dietz, Gilmor & Chazen in 2018. Prior to joining Dietz, Gilmor & Chazen, he worked as a legal clerk in Princess Cruise’s legal department, supporting the company’s risk management department. Mr. Tapia has also worked with the Ventura County District Attorney’s Office and the Los Angeles County District Attorney’s Office. In his free time, Andrew enjoys spending time outdoors and cheering on the Los Angeles Dodgers.